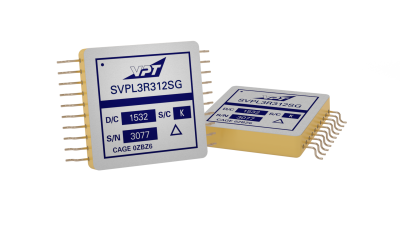 SVPL3R312SG Point of Load DC-DC Converter | VPT, Inc. The SVPL3R312SG is based on the Intersil ISL70002SEH radiation-hardened monolithic buck regulator. It is designed to operate from a nominal 3.3 V or 5 V bus. The SVPL3R312SG supplies low voltages at 12 A with high efficiency and fast transient response, making it an ideal choice to supply point-of-load applications such as high performance space processors.